Although Agatha is over three hundred years old, it certainly doesn’t mean that she can’t adapt and fit into ugly post-industrial small town suburbia. Partial to the delights that an evening at McDonald’s often serve her, she waits at her favourite dimly lit corner table – for her kind of take away. Being your typical urban vampire, this means that her fare isn’t up in bright lights on the menu above the cashiers. However, she usually finds exactly what she is looking for. Her teenage beauty, long blonde hair and ice blue eyes are a temptation very few can resist. After a long and predictable vampiric existence, trouble is afoot for Agatha. Red headed, freckled and just a little slow on the uptake sometimes, young Reggie stumbles into Agatha’s predictability and turns it on its head. Add the over-protective and rhyming ghost of a dead poet, a snarling black wolf, some cops and Agatha’s preference for the 1980’s fashion of mini-skirts, satin halter neck tops and knotted white blouses, things just may go awry. Along with a couple of untimely and unfortunate deaths, and Reggie’s complete misunderstanding of anything at all that’s going on, the awry becomes a dead certainty. 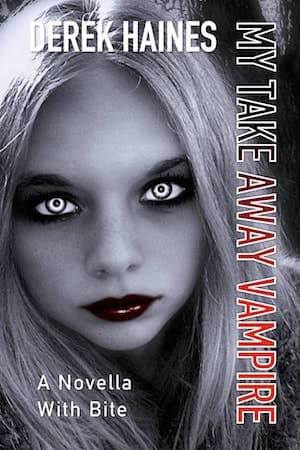 Enjoy My Take Away Vampire. A very different yet tasty little vampire tale. For such a short read the main characters were richly developed. Once started, I could NOT put this book down. 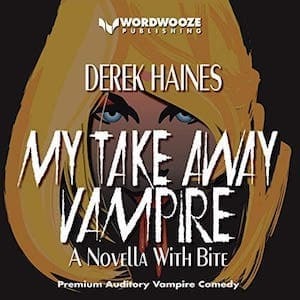 Haines puts and interesting twist on vampires that I did not, repeat not, see coming. A delightful book sure to please any vampire lover. Really great vampire story! I love reading vampire stories, but after a while they all start to seem too similar. This book is a nice change to the vampire craze, and is definitely worth reading. The characters in this book are very interesting and versatile, especially the ghost of the dead poet that is mentioned in the description. This book is diverse enough to appeal to a wide audience, and anyone who disliked Twilight can rest assured that this book is nothing like that series. Agatha is a teen vampire, but this book is not just a dull teen read. I would highly recommend this book. A great mix of classic vampire lour and modern pop culture this is a great short story. While it is not very long that only adds to the charm, an easy and entertaining read. A story of struggle with self control, lust and loss, the main character is a metaphor for us all struggling through life’s confusing stages. While the vampire theme may seem reminiscent of another popular vampire movie, the book in unique in its own way and is sure to please readers of all types. A bit of harsh language so probably not the best for young or timid readers, but not unreasonable. Over all a great read. This book is available in ebook and paperback.